Washington guard Andrew Andrews will try to guide the Huskies to a 1-0 start to the season in tonight's Spotlight Game against the Texas Longhorns. Photo courtesy of Drew Sellers of Sportspress Northwest. Check out the first day of VAVEL college basketball experts Tyler Bennett and Peyton Wesner putting their skills of prediction to the test. Today the road to Houston begins for 351 Division I college basketball teams. From North Carolina and Kentucky to Grambling State and UT-Rio Grande Valley, everyone is 0-0, including Tyler Bennett and Peyton Wesner. Over the course of the 2015-2016 season, a new chapter will be added to the rivalry that is between Canada and the United States as Bennett, from Canada, and Wesner, of the U.S., will go head-to-head on a daily basis to predict the outcomes of the nation's top games and early-season tournaments. So, without further ado, let's get started! ---12.4 PPG, 4.6 RPG, & 2.1 BPG. ---16.7 PPG & 1.4 SPG. Eastern Michigan infamously knocked off the Michigan Wolverines last year inside the Crisler Center, just a game after NJIT did the exact same thing. The Eagles are a young team this season, and may endure some growing pains along the way. Vermont's backcourt duo of Trae Bell-Haynes and Dre Wills will be too much for Raven Lee to handle, and Ethan O’Day will lead the Catamounts to victory in the first game of the regular season. The first matchup of the new season will go down in Ypsilante, Michigan, between two teams who made a postseason tournament last year. Can't beat that, right? Although the Eagles have the MAC's second leading scorer in "jazzy junior" Raven Lee still in the backcourt, the absence of Mike Talley (12.5 PPG) and Karrington Ward (12.5 PPG) shall be felt this morning versus a very balanced Vermont Catamounts squad that returns five of their top six scorers. Look for Vermont's Ethan O'Day to have a big game since Eastern Michigan has a big void left by Ward. ---14.5 PPG, 8.4 RPG, & 1.8 BPG. ---15.3 PPG, 5.4 RPG, & 3.4 APG. Although the Iowa State Cyclones have a new head coach in Steve Prohm, they return one of the more talented and experienced groups in the country. They are taking on a Colorado Buffaloes team who will be looking for someone other than Josh Scott to step up. Georges Niang, Jameel McKay, and the rest of the Cyclones should have their way with the Buffaloes, and get Prohm's first win at Iowa State. Georges Niang, Monte Morris, Jameel McKay, and Nazareth Long?! Steve Prohm could not have wished for a more talented group of men to start his tenure in Ames, Iowa. Yet, today's neutral site showdown will be far from an easy victory. As many feel Colorado will struggle without star Askia Booker (graduation), the Buffaloes still have a very strong frontcourt held down by Josh Scott and Xavier Johnson. In addition, one cannot forget Providence transfer Josh Fortune, who will try to produce just as well, if not better, than he did for the Friars (8.4 PPG). Though this contest will be very close, the Cyclones will pull away in the end on the backs of their talented upperclassmen. ---22.2 PPG & 5.0 RPG. ---16.6 PPG, 3.4 RPG, 2.4 APG, & 1.7 SPG. The Northwestern State Demons have the NCAA’s top scoring guard tandem in in the form of Zeek Woodley (22.2 ppg in ’14-15) and Jalan West (20.0 ppg). They’re back to lead the Demons again this season, and that’s bad news for anyone they play, including the Rebels. Ole Miss will counter with Stefan Moody in the backcourt and Liberty transfer Tomasz Gielo up front, but the Demons will outscore the Rebels and come away with a big road win. Defense or offense: The oldest question in sports will be answered this afternoon. This Southland versus SEC is more than another non-conference game for the Northwestern State Demons. The Demons, who possess the highest scoring duo in Division I basketball (Zeek Woodley and Jalan West-42.2 PPG), will look to attack a defensively sound Rebels' team. So what's going to give? With all love and respect for Woodley and West, the Demons will go on the road and pull off the upset on Ole Miss. Putting the Rebels' advantage of post presence with six foot, nine inch forwards Sebastian Saiz and Tomasz Gielo aside, Stefan Moody can only guard one of the two sharp shooters. Therefore, one will always have a favorable matchup to attack. ---13.6 PPG, 6.0 RPG, & 2.3 APG. ---16.8 PPG, 6.2 RPG, & 1.8 APG. While Gonzaga is without Kevin Pangos in the back court, their front court of Kyle Wiltjer, Domantas Sabonis, and Przemek Karnowski is one of the best in the country. They are all capable of putting the ball in the basket with consistency. Pittsburgh will counter with Brown transfer Rafael Maia and Richmond transfer Alonso Nelson-Ododa in the post to try and limit the damage done by the Bulldogs’ forwards. Unfortunately for the Panthers, they can only do so much. Gonzaga will to roll to an easy victory. Watch out west coast! He's back for more! With "Star senior" Kyle Wiltjer returning to Gonzaga, Mark Few's team is automatically a contender. Yet, honestly Wiltjer is just a piece of the best frontcourt in all of college basketball as Przemek Karnowski (10.9 PPG & 5.8 RPG) and Domantas Sabonis (9.7 PPG & 7.1 RPG) still preoccupy the post. That will be the deciding factor tonight because despite Pittsburgh owning the better guards with James Robinson (8.9 PPG, 3.6 RPG, 5.5 APG, & 1.1 SPG) and Chris Jones (8.5 PPG, 3.1 RPG, & 2.0 APG), the Panthers have no one to hang among the trees of Gonzaga. ---13.7 PPG, 3.0 RPG, & 2.3 APG. ---5.6 PPG, 1.8 RPG, & 3.6 APG. This game is a mismatch in terms of talent, since Kentucky has reloaded with another top-tier recruiting class. Albany, led by Peter Hooley and Evan Singletary, will keep the game reasonable and from getting too out of hand. With that said, Kentucky has talent all over the floor, and guards Jamal Murray, Tyler Ulis, and Isaiah Briscoe will be too tough to overcome for the Great Danes. This game will never be in question. Skal Labissiere, Jamal Murray, Isaiah Briscoe, Tyler Ulis, and Alex Poythress (5.5 PPG, 3.8 RPG, & 1.5 BPG)?! That's just unfair! Nevertheless, the Albany Great Danes still will walk into Rupp Arena with the intention to win. It isn't as though, Albany is bad (they actually have a very good players like Peter Hooley and Evan Singletary returning), but the Great Danes do not stand a chance this evening unless Hooley and Singletary combine for 45. Though, that still may not be enough. ---Veterans Classic in Annapolis, MD. ---12.9 PPG, 7.8 RPG, & 1.1 BPG. The injury to Marcus Paige will hurt the North Carolina Tar Heels in terms of their offensive output. However, they have plenty of options to survive without him. The preseason #1 team has a multitude of weapons at their disposal that will be too much for the Temple Owls to overcome. Temple has talent in DeCosey, Bond and Enechionyia, and will likely contend in the American this season, but the Tar Heels will be too much on opening night. Even though Marcus Paige is out due to a hand injury, the Tar Heels have more than enough offense with Brice Johnson, Kennedy Meeks, and Justin Jackson to survive Temple. However, by how much? Temple is a formidable foe even without two of their top three scorers (Will Cummings and Jesse Morgan) from last season. And because there is no doubt Quenton DeCosey will get "his," UNC will not blow away the Owls, yet still win by a comfortable margin. Both the Sycamores and the Jaguars are expected to make positive strides in their respective conferences this season. The Sycamores return their top three scorers from a year ago, led by Devonte Brown and Brenton Scott, while the Jaguars return three of their top five, led by Marcellus Barksdale and Mason Archie II. With the Sycamores getting an advantage from playing at home, they come away victorious in a game that will be worth a watch. Missouri Valley basketball: Can't top it! Last season, the Indiana State Sycamores shocked many teams in conference play considering how bad they performed during the non-conference slate. Now, with a backcourt of talent and experience, Greg Lansing's squad looks to avoid the reliving of such struggles against the sneaky good IUPUI Jaguars. While the Jaguars played poor (to say the least) last season, this year they have a potluck that includes elgible transfers, like Nick Osbourne and Matt O'Leary, and veterans, Marcellus Barksdale and Mason Archie II for example, which will ultimately lead to victories. Granted those bad boys from the Indy are not the favorites, but it should be no shock if they give the Sycamores a familiar feeling from last season. ---12.6 PPG, 4.9 RPG, & 1.2 SPG. ---17.0 PPG & 3.7 RPG. Last season, Texas Southern lost their season opener to Eastern Washington. This time around, Chris Thomas and the Tigers are hoping to come out victorious. Unfortunately, they head to The Pit, and New Mexico has a healthy Cullen Neal in the lineup. In three games a year ago, he averaged 17 points. Hugh Greenwood and Deshawn Delaney are gone, but Neal and big man Obji Aget will be enough for the Lobos to come away with a win to open their year. When "stud sophomore" Cullen Neal went down (injury), experts across the nation knew New Mexico was in for a long season. This year should be much more enjoyable. Neal, who is 100% healthy, looks prime to average 17-20 points for the Lobos this season. His dominance will start tonight against a depleted Texas Southern team that is missing two double-digit scorers. Playing at the Pit against a healthy Cullen Neal is bad news for the Tigers. Both the Salukis and the Falcons are going to be in trouble this season, as both are without many of their key contributors from a season ago. But, somebody has to win and somebody has to lose. The Salukis return star Anthony Beane and Sean O’Brien from last year’s team. While the senior guard can produce big buckets, O'Brien will take on a much bigger role on offense in 2015-16. Air Force is without their top four scorers from last season, making a win over Southern Illinois tough to see coming. Anthony Beane's Holiday? Considering how bad the Air Force Falcons were, he may have give SIU fans an opiening night present. As previously mentioned, Air Force had a very turbulent flight last season, for they possessed a record of 14-17. But they could have improved, right? No, not at all because their top three scorers from that team were seniors. On the other hand, Southern Illinois is also coming in worse than last year due to "fab freshman" Jordan Caroline and Deon Lavender transferring. So with two down on their luck teams facing-off, give the win to the team with the best player. That is, Beane and the Southern Illinois Salukis. The Bradley Braves are going to be a young team this season, and that will likely lead to their fair share of bumps, bruises, and losses. Senior guard Ka’Darryl Bell is their top returning scorer, at 6.1 PPG, whereas Ball State returns their top four scorers from 2014-15. After just 9 games a year ago, Jeremie Tyler is set to rejoin and Frank House for the Cardinals. The visitors will cruise on opening night. Ten. Not one, not two, but ten: That is the number of freshman the Bradley Braves have this season. After landing and losing (transferred to Dayton) the biggest recruit in school's history (Josh Cunningham), the Braves are looking at a horrific season ahead. But that was going to be the case with last season's leading scorer Warren Jones on the team (he was kicked off prior to the commencement of practice). While Ball State may not be in for a much better season than the Braves, the Cardinals have three double-digit scorers returning to Muncie. Seems determining a winner for this one is fairly simple. Oral Roberts lost high-scoring guard Korey Billbury to VCU (transfer) and Missouri State is without Marcus Marshall this season, meaning both teams will need others to step up. Fortunately for the Golden Eagles, they have a Summit League Player of the Year candidate in Obi Emegano back for his junior season, giving them a reliable force on offense. Missouri State will need big performances from returnees Camyn Boone and Dorrian Williams to knock off Oral Roberts, but it won’t happen. Oral Roberts wins a tight contest. At this time last season, the Missouri State Bears were looking to have a great season with superstar Marcus Marshall. What a difference a year makes. After a heated altercation last January, Marshall left the program leaving a gaping hole in the lineup. Thankfully, JUCO transfer Dequon Miller is prime to take over and produce points for the Bears. Expected to line-up across from the new face in Springfield on opening night is Oral Roberts' Obi Emegano. Emegano, who is the highest returning scorer from the Summit League, sees the time as right to lead the Golden Eagles to the NCAA Tournament. Yet, let's not get ahead of ourselves! Oral Roberts wins by at least 15. ---7.9 PPG, 5.2 RPG, 2.4 APG, & 1.1 SPG. ---13.6 PPG, 4.5 RPG, 5.2 APG, & 1.9 SPG. The Wichita State Shockers open the season against a Charleston Southern team who is looking for a new source of offense with the departure of Saah Nimley. The Shockers still have the guard duo of Ron Baker and Fred Van Vleet in town, and the addition of Anton Grady in the front court will be a big help. Wichita State is too strong for the Buccaneers, and they will roll to a relatively easy opening night victory. The pursuit for perfection starts tonight! The Wichita State Shockers start off the year once again on everyone's radar for one reason: experienced talent. This evening it will definitely be seen. Now if this was last year's Charleston Southern Buccaneers team with Saah Nimley and Arlon Harper, it would be a different story of who will win. But since it isn't, expect Ron Baker, Fred Van Vleet, and Anton Grady to dominate without really breaking a sweat in a very lobsided victory. The fact that North Florida returns their top three scorers from a season ago doesn’t bode well for the Fighting Illini, who are dealing with injuries to key players to start the year. Kendrick Nunn will be out for 7 more weeks, Tracy Abrams will miss the year, and they are relying on a new point guard in Khalid Lewis. That’s not a recipe for success for Illinois, who aren’t even playing on their true home floor due to renovations. All signs point to an upset by the Ospreys. Springfield is not a neutral site, just wanted to lay that out up front. Nevertheless, it won't matter this evening. The Illinois Fighting Illini will be without two projected starters due to injury (Tracy Abrams and Kendrick Nunn) when they tip-off against a guard heavy North Florida squad. Without the points of the injured, there is no reason the Ospreys won't win this game considering the ability of Dallas Moore, Beau Beech, and Chris Davenport. The Loyola (IL) Ramblers are coming off an impressive win of the 2015 CBI last season. The Ramblers return three of their top four scorers from last year, including a healthy Milton Doyle who came off the bench in their run to the CBI title. With him healthy in the lineup, the Ramblers will be too much for the Roadrunners. UT-San Antonio will be missing three of their top five scorers from a season ago. All signs point to a confident win for the Ramblers. UTSA, you all are in big big trouble. Why? Milton Doyle is completely healthy. In this journalist's opinion, Doyle has been disrespected by Missouri Valley Conference media members for the reason of being left off the preseason first team. Tonight MD35 will make an opening night statement with a superstar performance of 18+ points and 7+ assists in a "never in doubt" victory over the Roadrunners. Beware the "Big Bs" Marquette! The Belmont Bruins enter the new season as one of the best mid-majors in the country thanks to Craig Bradshaw, Evan Bradds, and Taylor Barnette, also know as the "Big Bs." But do they have what it takes to defeat Marquette. Well, if they can knock down their three pointers, then yes. Though, if there is a lid on the basket from long range, the advantage shifts in favor of the Golden Eagles and their young guns such as freshman Henry Ellenson and "stud sophomore" Duane Wilson. Kim Anderson’s brief tenure at Missouri has not gone well, and this year doesn’t look like it’ll be much better. The Tigers’ top two players, in Montaque Gill-Caesar and Johnathan Williams III, transferred out of the program. This year, Missouri will rely on Ryan Rosburg and a slew of newcomers, which does not signal success. Wofford may be without Karl Cochran, but Spencer Collins and Eric Garcia lead a talented group into the year. The situation is ideal for the Terriers to come away with a win that shouldn’t be considered an upset. With the last few seasons in considering, a great deal of doubt is surfacing on whether Missouri will ever be a powerhouse like during the days of Kim English. One should not expect a rise this season, for last year's leading scorer Johnathan Williams III decided to sit out a year in order to play for Gonzaga while "fab freshman" Montaque Gill-Caesar is also heading west to suit up for San Diego State. Despite Wofford losing a pair of key seniors from last year (Karl Cochran and Lee Skinner), the Terriers still have a lot of bite to their offense and will go on the road to pull off an incredible upset. Eastern Washington is without premier scoring guard Tyler Harvey, who left after his junior season for the NBA Draft. Relying on big man Venky Jois and hoping for a breakout year from a pair of Saint Louis transfers, Austin McBroom and Bogdan Bliznyuk, the Eagles will be in for a tough test versus Bulldogs on opening night. With Ben Howland behind the bench, and star freshman Malik Newman joining the likes of Craig Sword and Gavin Ware at Mississippi State, the Bulldogs will come away victorious and kick off the new era of Bulldog basketball on a high note. One star exits from Eastern Washington while a "fab freshman" enters for Mississippi State. What an awful combination of events for the Eagles. Though EWU still has a very accomplished scorer in Venky Jois, without Tyler Harvey's 22.9 points per game, an upset against a new and improved Bulldogs' team is nearly impossible. While you must keep an eye on freshman Malik Newman this evening, don't forget to take a look at senior big man Gavin Ware. Ware is looking to build onto a season, in which he averaged 10.0 points and 7.1 rebounds per game. Last season, Navy played the Michigan State Spartans tight the entire way, losing by just 5 in the Veterans Classic. This season, expect them to play Florida close as well, as the trio of Tilman Dunbar, Kendall Knorr, and Will Kelly will keep the Midshipmen competitive. However, new head coach Michael White will have the Gators ready to roll in their regular season opener. Kasey Hill and Dorian Finney-Smith will lead the Gators to a hard-fought victory. Will home court advantage help Navy take down Florida? Not today! Though Michael Frazier II left Gainsville too soon in an attempt to pursue an NBA career and Eli Carter wanted to get out of town so bad, he transferred to Boston College, the Gators will be just fine. A key trio that will need to perform in order for Florida to have great success is that of Dorian Finney-Smith, Kasey Hill, and Devin Robinson. If the three play even to only half of their ability, tonight's victory is within their grasps. Yet, a dominating win means nothing to how Florida will perform in the later stages of the season against quality opponents. The UAB Blazers made headlines last year when they knocked off Iowa State in the NCAA Tournament and they're looking to ride that momentum this season with virtually the same roster. Led by sophomores William Lee and Chris Cokley, the Blazers will give Auburn a run for their money. Bruce Pearl’s team looks to be much-improved in comparison to last, and the addition of Marshall transfer Kareem Canty helps to bolster the backcourt. On this night, Auburn will come out victorious due to their experience and depth. The round of 64 had just started when the UAB Blazers shocked the world by upseting Georges Niang's mighty Iowa State Cyclones. So tonight's game should be a piece of cake, right? Not exactly. While UAB's six highest scorers from last year's team returns, Auburn has a bona fide scorer coming from Marshall University in Kareem Canty. Canty, who was the Conference-USA Freshman of the Year two years ago, averaged a whopping 16.3 points and 5.5 rebounds per game for the Thundering Herd. Expect him to be the difference in a very, very, very close matchup. ---15.6 PPG, 6.5 RPG, 3.7 APG, & 1.2 SPG. ---11.6 PPG, 11.6 RPG, 1.2 SPG, & 1.0 BPG. This contest has upset written all over it. The Lumberjacks have been one of the nation’s best mid-major teams over the past three years, and this year will be no different. Reigning Southland Player of the Year Thomas Walkup will have his hands full with Baylor’s Rico Gathers and Taurean Prince. Ultimately, Gathers’ ability to corral rebounds on both ends of the floor will be the difference in this one, as Baylor squeaks out a close win to open the season. The intra-state matchup of the night will transpire in Waco, Texas. As Belmont, one of the best mid-majors entering the season is the Stephen F. Austin Lumberjacks. Led by Thomas Walkup, Stephen F. Austin will look to start the season in grand fashion by upseting Big 12 member Baylor. Just to say up front, it will not happen. One must recall that the Lumberjacks' second and third highest scorers will be absence this year as Jacob Parker graduated and Clide Geffrard Jr. transferred to Samford. On the other side of the court, the Bears bring back the dynamic duo of Taurean Prince and Rico Gathers. ---12.8 PPG, 5.6 RPG, & 1.0 SPG. ---11.1 PPG, 5.3 RPG, & 1.9 APG. Last season, the Aztecs struggled to put the ball in the basket, finishing 305th in the NCAA with 61.8 points per contest. Yet, left their mark on the defensive end of the floor, and will do so again this season. Since Illinois State has the edge in terms of guard play with DeVaughn Akoon-Purcell, Paris Lee, Bethune-Cookman transfer Quintin Brewer, and New Mexico transfer Nick Banyardwill, they have the enough in the frontcourt for the Redbirds to upset the Aztecs as a part of the MW/MVC Challenge. Now these are the kind of matchups fans have been missing without the MW/MVC Challenge! With both teams looking at a great opportunity to add a quality win to their resumé, San Diego State will shoot down the Redbirds. Although the Aztecs have many stretches of woeful play when it comes to putting "the biscuit in the basket," Illinois State is without two of their best scoring options from last year (Daishon Knight graduated and Reggie Lynch transferred). Considering the experience of San Diego State senior Winston Shepard, he will be the difference. ---15.7 PPG, 7.8 RPG, 1.8 APG, & 1.1 BPG. ---16.4 PPG, 5.0 RPG, 3.8 APG, & 2.0 SPG. The Pepperdine Waves have been on a steady rise over the past few seasons, and forward Stacy Davis has been a big reason why. Their core group returning has played together for the better part of the last three seasons, giving them an edge over Fresno State. Cezar Guerrero is a strong point guard, and Marvelle Harris could be the Mountain West Player of the Year in 2015-16, but Pepperdine will squeak out a road upset win on this night. To simplify what will be a very entertaining battle between the Pepperdine Waves and Fresno State Bulldogs, whoever scores more between Stacy Davis and Marvelle Harris will supply his team with a 1-0 record. In their previous campaigns, the two superstars led their individual squads in points as well as rebounds. In fact, Harris actually led Fresno State in assists as well! Even though the smart pick is to go with the home team when two teams are evenly matched, this journalist feels Davis will hit just one more shot than Harris to lead the Waves to a road win. ---13.1 PPG, 3.2 RPG, 4.6 APG, & 1.0 SPG. ---15.0 PPG, 4.3 RPG, 2.2 APG, & 1.4 SPG. This game has the potential to be a rout. Texas returns a ton of talent from last year’s team, and has brought in a high-profile recruiting class to ease Shaka Smart into his new job as head coach after coming over from VCU. Outside of Andrew Andrews, Washington will be relying heavily on freshmen to start the season, which may not bode well for them. Washington has the potential to keep this close, but Texas rolls in Shanghai. 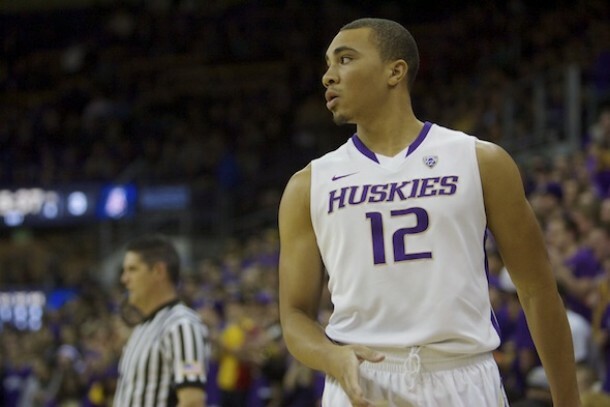 How good would the backcourt of the Washington Huskies have been if Nigel Williams-Goss would have stayed? Talented enough to defeat the Texas Longhorns? With the mass exodus of what seemed like everyone in Seattle, Huskies' fans are fearing a very mediocre season ahead. Tonight will be the start. As good as Andrew Andrews is, there is a very slim possibility that he will be able to stop "stud sophomore" Isaiah Taylor and big man Cameron Riley (especially without Robert Upshaw Jr.). ***Picking the spotlight game correctly earns two points while the rest are worth one.